SHOP TALK MMS FEBRUARY 2018 46 mmsonline.com Industry News Conference Envisions Merger of Machining and Engineering Workflows BY MATT DANFORD | SENIOR EDITOR The words, "Machinists were created because engineers need heroes," were emblazoned across T-shirts popular among the machining crowd at Autodesk's annual user conference, Autodesk University (AU), a few years ago. The shirt was fitting for the occasion, with the company fresh off a number of investments evidencing its increasing focus on CAM software in addition to its traditional design and engineering offerings. 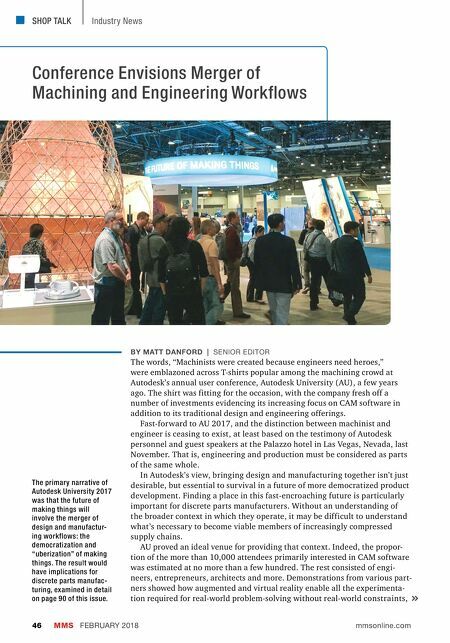 Fast-forward to AU 2017, and the distinction between machinist and engineer is ceasing to exist, at least based on the testimony of Autodesk personnel and guest speakers at the Palazzo hotel in Las Vegas, Nevada, last November. That is, engineering and production must be considered as parts of the same whole. In Autodesk's view, bringing design and manufacturing together isn't just desirable, but essential to survival in a future of more democratized product development. 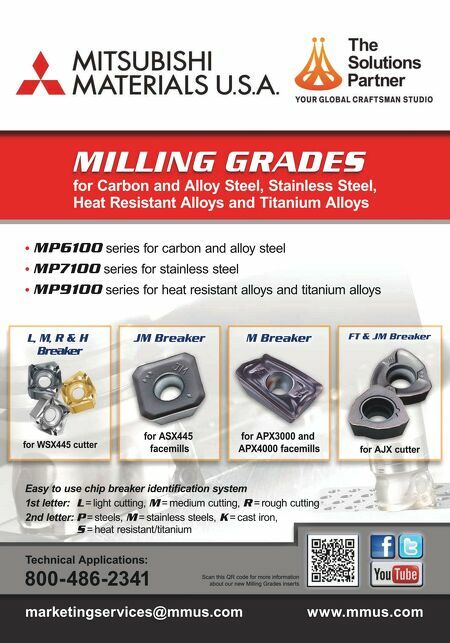 Finding a place in this fast-encroaching future is particularly important for discrete parts manufacturers. Without an understanding of the broader context in which they operate, it may be difficult to understand what's necessary to become viable members of increasingly compressed supply chains. AU proved an ideal venue for providing that context. Indeed, the propor- tion of the more than 10,000 attendees primarily interested in CAM software was estimated at no more than a few hundred. The rest consisted of engi- neers, entrepreneurs, architects and more. Demonstrations from various part- ners showed how augmented and virtual reality enable all the experimenta- tion required for real-world problem-solving without real-world constraints, The primary narrative of Autodesk University 2017 was that the future of making things will involve the merger of design and manufactur- ing workflows: the democratization and "uberization" of making things. The result would have implications for discrete parts manufac- turing, examined in detail on page 90 of this issue.